This opens the door for metal organic-frameworks to one day efficiently store renewable energy at a very large, almost unthinkable scale. "For the first time ever, we have demonstrated a metal-organic framework that exhibits conductivity like that of a metal. 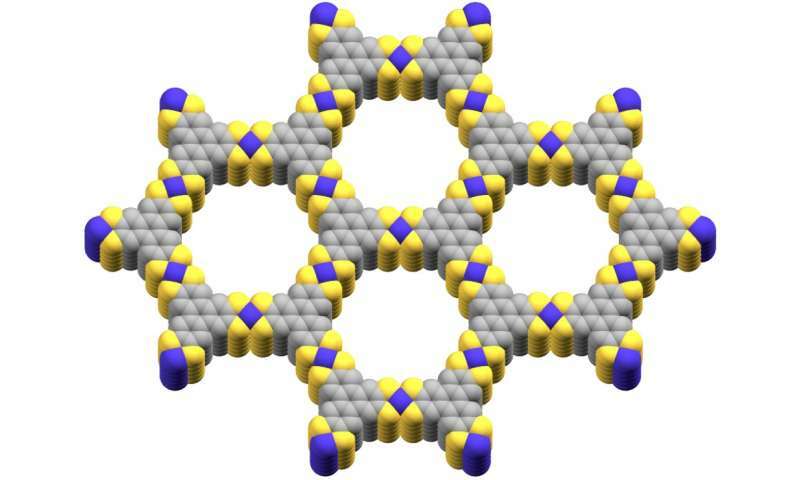 The natural porosity of the metal-organic framework makes it ideal for reducing the mass of material, allowing for lighter, more compact devices" said Brent Melot, assistant professor of chemistry at the USC Dornsife College of Letters, Arts & Sciences. "Metallic conductivity in tandem with other catalytic properties would add to its potential for renewable energy production and storage" said Smaranda Marinescu, assistant professor of chemistry at the USC Dornsife College. Their findings were published July 13 in the Journal of the American Chemical Society. Metal-organic frameworks are two-dimensional structures that contain cobalt, sulfur, and carbon atoms. In many ways, they very broadly resemble something like graphene, which is also a very thin layer of two-dimensional, transparent material. In the experiments run by Marinescu's group, they used a cobalt-based metal-organic framework that mimicked the conductivity of both a metal and semiconductor at different temperatures. The metal-organic framework designed by the scientists demonstrated its greatest conductivity at both very low and very high temperatures. I interpreted this as one gram of material has the equivalent surface area of thousands of square feet. This is very probable shorthand by the writer.